The phase stability, structure and dynamics of microemulsion-based organo-gels formed by water/AOT surfactant/alkane in the presence of gelatin are presented. The gels are optically clear, one-phase systems with a melting point at the gelatin helix to coil transition temperature of ∼30°C. 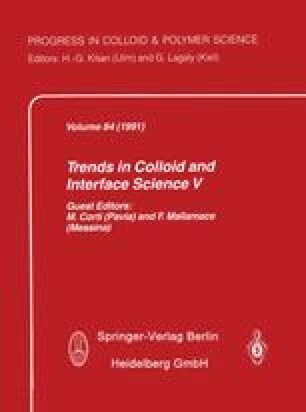 Observations of phase stability as a function of composition variables (water and gelatin) and temperature have been made. These experiments show that gelation depends on the composition of the parent microemulsions and the gelatin concentration. Fluorescence recovery after photobleaching (FRAP) was used to measure diffusion of fluorescent probe through the aqueous phase. FRAP results indicate two distinct structural parts to the gels: a concentrated gelatin/water network and coexisting microemulsion droplets; 70% of the water is in the droplets, in good agreement with previous small-angle neutron scattering work.